The Dennis Oland murder retrial heads into its next day of testimony. It was really important to do the utmost careful examination? asks Gold. Yes, says MacDonald. And that’s what you did? Tried to, yes. You did everything conceivable to examine this log book? Yes. Moving on to search of a sailboat co-owned by Dennis Oland’s wife Lisa. Nothing of interest or significance found MacDonald acknowledges. The only thing of interest you found in relation to the log book was a stain on one page that you determined pre-dated the homicide? asks Gold. Yes, says MacDonald. Now on to Dennis Oland’s BlackBerry cellphone he used the day of the murder. It was seized during search of Oland’s home a week after the murder and searched in detail for blood traces but none found. Cellphone records show Oland received a call on the phone at 6:36 pm the day of the murder - within minutes of when police believe the killing occurred (an hour before defence believes it occurred) but no blood traces found. Gold asks about MacDonald's examination of Oland's Blackberry. Lots of crevices, lots of places for blood to get trapped? Yes. Nothing found linking Oland to this homicide? I didn't find any evidence with blood or DNA, replies MacDonald. On to the brown jacket. Were you upset when Sgt. Russell touched the brown jacket with his bare hands? Before I could say ‘don’t do that he did it’. But that’s not proper? No. And you rolled up the jacket and placed it in a bag that was smaller than the jacket? Yes. And in retrospect do you accept that raises the chances of stains from one part of the jacket being transferred to another part of the jacket? Yes. 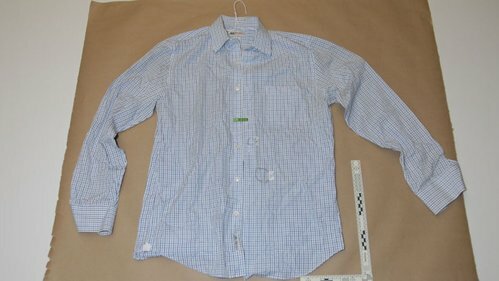 Gold asks about a J-Crew blue&white shirt police seized from Oland's bedroom closet during house search warrant on July 14, 2011 - a week after his father's body was found. MacDonald noted some stains. No blood found, no "human DNA" found? Correct. In the future you will treat jackets like this differently? If I had it to do over again I would do it differently, yes. You don’t know what effect cramming the jacket into that small bag might have had on those stains? That’s right. MacDonald says he considered the jacket to be a “dry” exhibit and in little danger of being disturbed by folding but agrees it should have been treated more carefully. In retrospect, you agree that raises the danger of trace evidence migrating from one part of the jacket to another? asks Gold. It could, yes, replies MacDonald. But MacDonald adds that it was a "dry exhibit." Gold questions whether he thought about that at the time or if it's "after the fact rationalization." 'You really didn't say to yourself, 'I shouldn’t be rolling this up?'" he suggests. No, acknowledges MacDonald. Gold moves on to other items seized in the home that turned up no useful evidence. A pillow, a duvet, trash from a washroom wastebasket etc. Next time you seize a jacket you won’t be rolling it up? asks Gold. I would do it different, yes, replies MacDonald. Next up - eight pairs of Dennis Oland’s shoes seized by police at his home and tested for blood traces. Nothing. Gold asking about MacDonald's examination of 8 pairs of shoes seized from Oland's home, including a pair Gold identifies as being the ones Oland was wearing when he visited his father on the night he was killed. Didn't find any blood? No. You checked stitching in the shoes, laces, the eye holes that laces travel through, the soles of the shoes all very carefully for traces of blood? Yes. And found nothing? Nothing. Gold displays a photo of the shoes in question on a large screen in the courtroom and points out the stitching. Perfect to capture blood? It’s possible, yes, replies MacDonald. Gold displays another photo of the soles and points out the "canals." If those shoes stepped in a pool of blood, there's "lots of little places here for trace evidence of blood to sit for the police to find?" It’s very possible, agrees MacDonald. You examined them very carefully, didn’t you? asks Gold. I did, says MacDonald. You didn't find any blood? No. Gold tells Justice Terrence Morrison he believes he's finished questioning MacDonald, but requests court take morning recess now so he can review his notes. Dennis Oland retrial is back in session. Defence lawyer Alan Gold has a few more questions for forensic Const. David MacDonald. You saw no evidence that the bottom of Oland's shoes had been cleaned? asks Gold. No, says MacDonald. Gold points out debris. MacDonald agrees. Gold finishes with MacDonald. He was scheduled for three days of testimony but barely took 1. Justice Terrence Morrison asks MacDonald about one of the shirts previously discussed. What shirt is that, what examination was done and what was the result? judge asks. One of 7 seized from Oland's closet, court hears. MacDonald examined it on Nov. 17, 2011 with negative results, then treated it with chemical reactant LMG on March 22, 2012 and found a stain. He sent it to the RCMP forensic lab for further testing. Negative results, he says. To speed the trial up further, defence and crown lawyers have agreed to enter certain testimony from the previous trial into evidence in this trial. Court is now preparing to watch video from the first trial of a crown expert rather than have the witness reappear. MacDonald is excused. Crown prosecutor Derek Weaver starts playing videotaped testimony of senior RCMP forensic analyst Neil Walker from Oland's first trial in 2015. Lawyers have agreed to use this rather than recalling Walker, which is expected to help save some time. Forensic computer expert Neil Walker is testifying about the computers in Richard Oland’s office and when they were last connected to his cell phone and last used the day of the murder.